The tablet has somewhat become the portable device of choice for many people today. It has a larger display than a smartphone but lighter and more convenient to carry around than a notebook. It is no wonder why the iPad has become so popular. Because of this, the tablet has gradually seen an increase of functions that its many applications now provide. One interesting iPad application is the Parallels Access app. 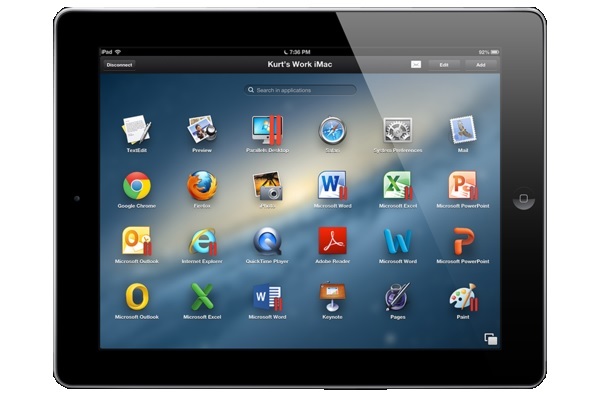 The Parallels Access iPad app allows you to make use of your desktop applications right from your iPad. The app supports both Windows and Mac PC’s. You can use Parallels Access to use the productivity applications from your PC on your iPad. You can also access entertainment content from your computer and stream it into your iPad. It is the only app that applies all the useful iPad gestures into the desktop applications that you need and use from your computer at home. You can tap, swipe to scroll or pinch on your iPad while using Apple iWork, Microsoft Office or any other productivity applications on your tablet. Another useful feature of the Parallels Access iPad app is that it works even when there is a slow connection. The app bridges the gaps within low bandwidth connections to provide you with smooth and uninterrupted use of your desktop applications. A faster connection will make the app work even better. The Parallels Access app is free to download on the iPad. You can download the application for your Mac or PC by going to the Parallels website. It comes with a 14-day trial with initial use on a single Mac or PC. After that, the app works as a subscription service where you need to pay around $ 80 yearly per computer to use. If you wish to use the app to access multiple computers, then you may have to pay a yearly subscription for each one for the privilege. It can come at quite a substantial cost. But it may be worth it if you needed to increase your productivity by taking advantage of the time you spent on the road by working more.